I see the words on an inspirational magnet in a shop window. the late American experimental composer John Cage (1912-1992) tells us. But what was the point of this telling? Cage in fact walked the walk of his talk, relying on rolling dice, consulting the Chinese I-Ching book of hexagrams, and even scrutinizing the minute imperfections of music staff paper to define anywhere for him and assist in making the decisions (or free himself from the decision-making) required to construct his music scores. But again, what was the point of this telling? 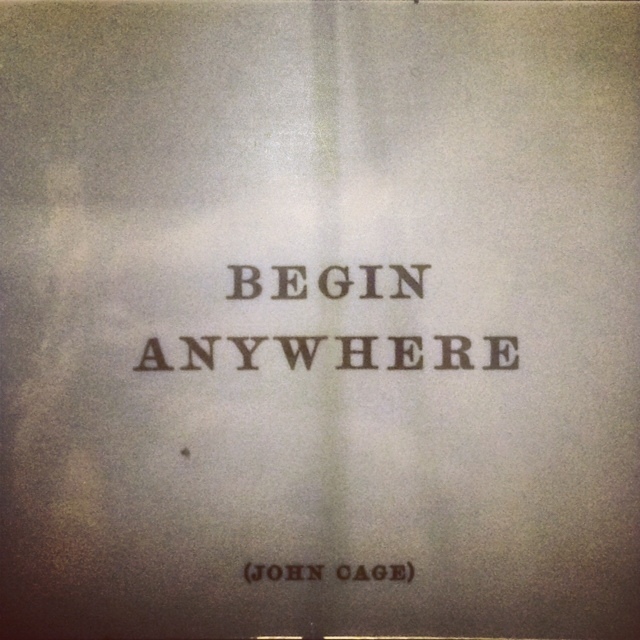 A quick and perhaps unreliable Internet search reveals that Cage might have meant his words as advice for those facing the psychological paralysis brought about by not knowing where to begin their project, their work, their book, their art. Perhaps–and now that I think of it, Internet searches themselves can often be exactly like this as well–the problem is having too many options, too many links, which brings about a flawed question to oneself: Where’s the best place to begin (my search, my project, etc.)? It’s a flawed question because there is no best place to begin. From the standpoint of creative work, all places are good enough and all places are beginnings. Finally, something else comes to mind when I think about that inspirational magnet. Begin anywhere, certainly, but once begun with whatever it is that you’re doing, be deliberate about your going. Cage walked the walk of his talk in this respect too. Whatever methods he used to help him make musical decisions, once he set up the system, so to speak, he rigorously adhered to it, letting it take him and his compositions somewhere (and these somewheres didn’t always make for engaging listening either). In other words, it takes a great discipline to grant oneself the freedom to begin anywhere and then let that anywhere run its course. Reblogged this on Bie Mariën.